my search for small-town fiestas brought me to bacolod last weekend to see the mudpack festival in mambukal, in the town of murcia, which is less than an hour's ride from the capital of the sugar-producing province of negros occidental. as you may have learned from reading this blog, i am a fiesta man, and i chase these colorful street parties wherever they may be. while i've been to the more popular ones, i've wondered often if there are unknown gems tucked in some far-flung town somewhere, waiting to be discovered. this year, i wanted to start on that project, so i searched for one that wasn't quite in the radar of most tourists yet. the mudpack festival fit the bill. murcia is adjacent to bacolod, but the place where the festival is held is in the foothills of mount isarog. i've been there before. twice, in fact, and i was eager to go back. getting to mambukal is a chore. you go to the market in libertad and ride these trucks that had been converted into buses, fitted with bodies that have seats too small for the two or three persons that are supposed to sit there. the bigger ones are fuso, the smaller ones, canter. i arrived in mambukal resort just as the festival was opening. already, i spotted several young men (boys, really) and a few young women covered in colored mud, wearing nothing but slivers of cloth. they posed on cue. the moment they felt a camera lens focused on them, they would strike a figure, probably menacing, evoking something organic, something of the earth. i didn't know much about the origins of the fiesta, although this year was already the 16th time it was being celebrated. only later did i realize that it was a celebration of the rich mineral clay resources one might find in mambukal. it's said that the mud you'd find on the slopes of isarog has healing properties. but unlike festivals that exhort certain saints or a bountiful harvest, the mudpack festival styles itself as a celebration of nature and art. this year's theme was water, which is fast becoming a precious, if not, limited resource. then the program started and thus began the downward spiral of the festival's artificial foundations. as a murcia local mentioned to me, the mudpack isn't a real fiesta. it was a creation of the local municipality to promote mambukal and to attract tourists. unlike the success of bacolod's masskara, however, this one has very weak legs to stand on. the premise itself is a bit tenuous to sustain, that i'm almost sure next year's won't be any better. it's just that there isn't much you can do with people covered in mud. the program opened with a prayer where some local artist offered a broad leaf filled with mud to the gods. he then went around swiping the cheeks of the audience with the colored clay. it seemed promising at first, but the subsequent portions were unimpressive, kind of crass, and even downright silly. there was an individual and group dance compettion. the hosts seemed to be self-aware, and often wondered what on earth was going on. they joked about the art being so deep, only the judges would understand. the problem is, when you get small-town teenagers to do contemporary dance moves, it looks awful. then there was a percussion contest. i hear the one in la carlota is so much more exciting. the only difference here was that they were all covered in mud. there were several visual arts competitions as well, all revolving on the theme of water. apparently murcia isn't lacking in homegrown talent, although i dare not comment on the quality of their work. they had a mixed-media competition, an art installation, and a contest for kids. also, the artists used an unusual canvas: human beings. they had some rules: that there should be more actual mud rather than paint, and in any case, latex wasn't allowed. 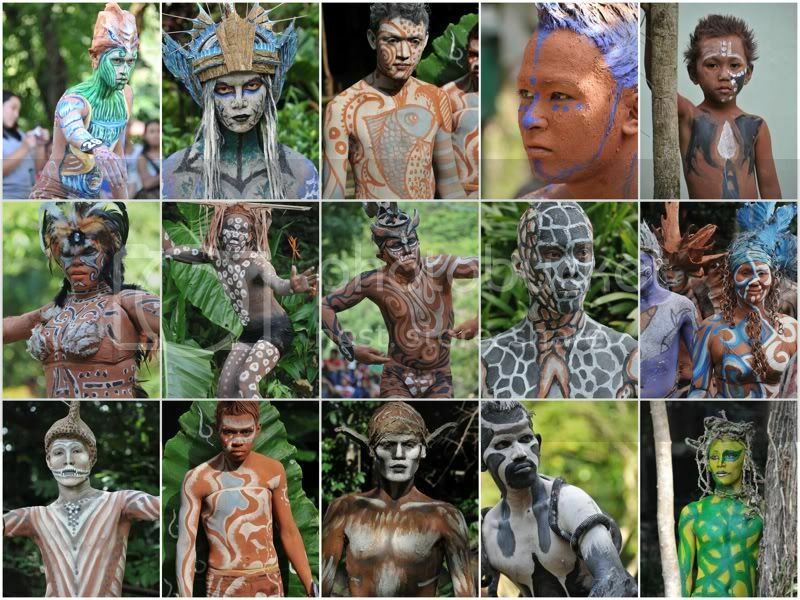 the human artworks walked in front of the judges in character. anything to attract attention. there were about 40 entrants so they had to work hard to get points. aside from water, recycling and the use of nature's products was common. the catwalk portion was a little comedic. one entrant had a helmet of mud that made it difficult for him to open his eyes, so he didn't really know where he was going. in almost all cases, the mud was just falling off. imagine if it had rained. the worst though was the solo dance improvisation contest. basically they placed a huge bucket of water in the middle and the dancers picked out two random items to dance with. one picked rope and toilet paper. another was given a slipper and a tray. and they had to incorporate those items into their dance routine. it was a joke. not only to the audience, but also to the dancers. i mean regardless of your talent, you had to find a place in your movements for these two unrelated objects. and yet most of them were very serious, as though they were dancing about something so important. so heavy. so relevant. i would have just continued with the joke that the contest was and made the audience laugh. so how to save the mudpack festival? actually encourage everyone -- whether competing or just visiting -- to walk around covered in mud. much like the tomatina festival. and have music play all day and all night. and have some dancing. lots of street dancing. none of these pretentious rubbish imagined by an uncreative bureaucrat. but would filipinos be so willing to get down and dirty? in a real fiesta, hardly anyone would care.